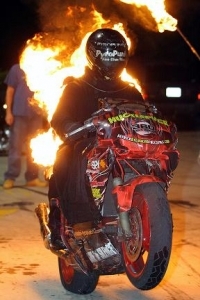 Some people are born entertainers, but Patrick S. does it on one wheel instead of 2 legs. I assure you the amazing one-man show that is Patrick Stephens is worth suffering through the scorching heat of south Texas Summers and the freak winters that chill us to the bone. Many, actually, swear up and down that he came out of the womb with a gold glittered helmet on and one hand up in the air. But for those who don’t know how this Captain America came to be; here’s the tale that’s changed many a life. 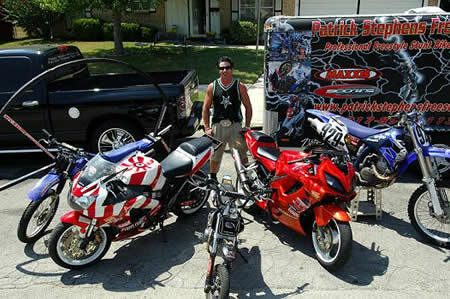 Patrick S. born in Philly, PA made the move of a lifetime to Texas at only 3 years old. While there he found his way to the fast piece of machinery that would begin the first stroke on the masterpiece that is his motorcycle career. Dirt bikes…that’s right motocross. The rush of power had overwhelmed him and for once in his life, he was beginning to see what life had in store for him. Then in 1997 he picked up his first street bike. Not on one wheel yet…He was going to try his luck as a road racer. 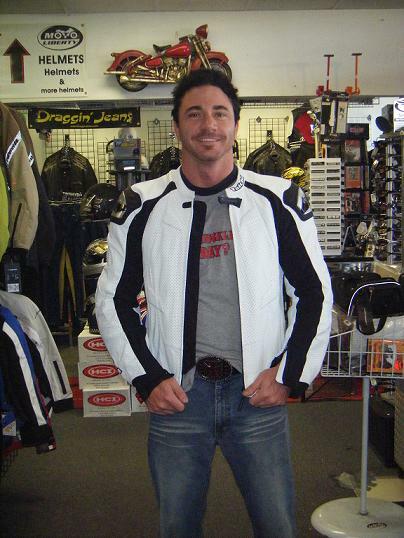 During his racing endeavors he rode as a privateer on the WERA and CMRA circuits, but it just didn’t feel right yet. One year later he decided to take his own route…The blurry picture of his existence was coming into focus. It wasn’t a grand epiphany, or even a televangelist that changed his life. It was a Honda 929, his one true love. “Entertaining is what I was put on this earth to do. I decided I was going to take my stunting career as far as possible and do it my own way,” Patrick says. He did it his own way all right. Thrilling crowds with his low speed tricks. Being best known for the Captain America, a trick which he invented and is being performed all around the world,. This trick requires amazing strength and balance, and continues to stun people all over the WORLD! “Low speed stunting requires a rider to have much more bike control and balance.” While many prefer to be entertained from the comfort of their home, there’s nothing like watching this stunting genius at work in person. 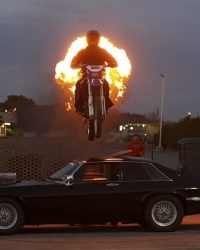 He’s performed on everything from large drag strips to driveways and parking lots. * Minimum space need 120 feet long, 60 feet wide. That’s the length that 15 parking spots are wide, and the width that 3 parking spots are long (considering the ave parking spot is 8×20). The riding area would be the shape of a rectangle. *Space that is preferred is 160 feet long, and 80 feet wide. That’s the length that 20 parking spots are wide, and the width that 4 parking spots are long (considering the ave parking spot is 8×20). The riding area would be the shape of a rectangle.